As soon as I saw my client’s floor plan I was concerned about the missing areas. During my visit she told me that both she and her husband had been having health problems since the time they moved into this apartment and that their older son had developed allergies and was also falling sick frequently. The baby had still been OK, but my client was getting increasingly concerned that he too might fall victim of illnesses at some stage. Once I took the compass readings I was not surprised to hear this. The EAST sector, which corresponds to the Health Sector according to the Eight Aspirations Formula of Feng Shui, was almost completely missing! If this was a house or a ground floor unit there might have been ways of including the missing areas. But this apartment was on a high floor. My recommendation was to strengthen the East areas in the boys’ bedrooms as much as possible by using the colour green, and to add some healthy plants in the East corner of the SE balcony. 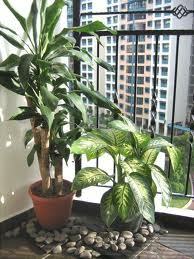 Plants represent the Wood element which is the element of the East and SE sectors, and healthy, upward growing plants represent growth energy and good health which was obviously desperately needed here. It is also important to use plants with rounded leaves rather than spikey leaves, so palm trees or cactuses are to be avoided. In addition, I recommended to place a metal Wu Lou on the husband and wife’s bedside tables and to hang a Wu Lou Windchime in the older son’s bedroom. 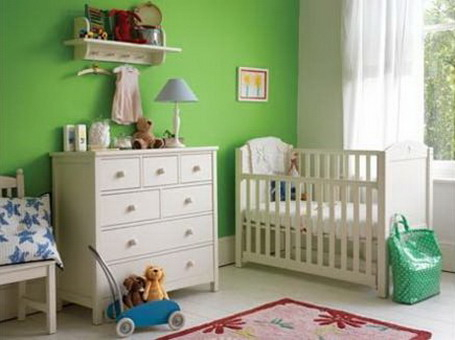 My client proceeded to paint not only the East corners, but the whole SE wall in both boys’ bedrooms in a bright, friendly shade of green, and added lots of plants on the SE balcony as I had recommended. This was the result I had hoped for!